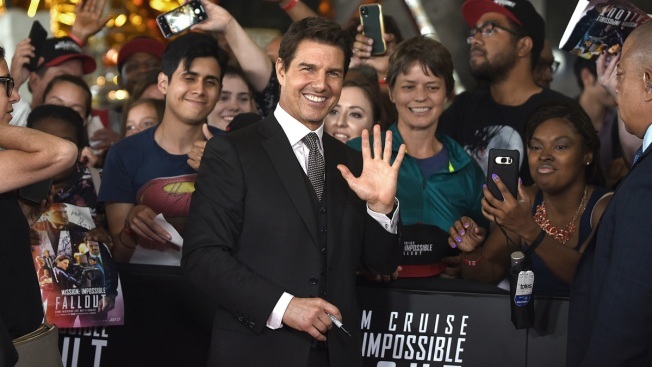 Tom Cruise greets the fans at the U.S. Premiere of "Mission: Impossible - Fallout" at Smithsonian's National Air and Space Museum on July 22, 2018, in Washington, DC. After six movies, 22 years, countless bruises and a broken ankle, Tom Cruise's death-defying "Mission: Impossible" stunts continue to pay off at the box office. The film earned positive reviews from critics and younger audiences, but also faced a fair amount of animated competition from both "Hotel Transylvania 3" and "Incredibles 2," which is still going strong in its seventh weekend and headed toward the $1 billion mark. As of Sunday, the Disney/Pixar sequel had earned an estimated $996.5 million globally.